Never be short of (pretend) cash again! 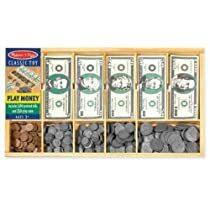 With fifty of each denomination, this set includes familiar looking paper bills and plastic coins. This stash of cash conveniently stores in a handy wooden “cash drawer” box. Each compartment has the denomination printed inside for easy matching cleanup.